After a very successful all day crop at Mt Pleasant Community Centre this past Saturday, I find myself a little behind. So this will be me catching up. Attend my next all day crop at Mt Pleasant Community Centre on Saturday, December 1st from 10am to 10pm. You will be spoiled with 6 ft of your own personal cropping space, lunch and dinner and yummy snacks, and a very cool make & take. Todays Christmas project is my rag wreath. Oh my gosh! I love this. I did this class at Elmhurst craftD Christmas Retreat. 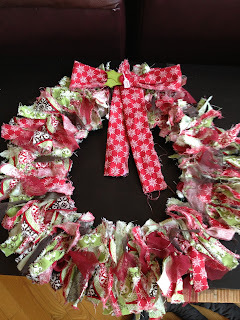 It is so easy and we have Christmas fabric available on the clearance rack. glue so this is a no sew project. It's great to make while sitting in front of the t.v. I love this! What a gorgeous wreath!